It’s quite possibly the worst idea in the history of criminal activity. It makes an oxygen mask look like the greatest disguise in history. Matthew Allan McNelly and Joey Lee Miller, two twenty-somethings from Carroll, Iowa, decided to break into an apartment. To break in, you need a a disguise. 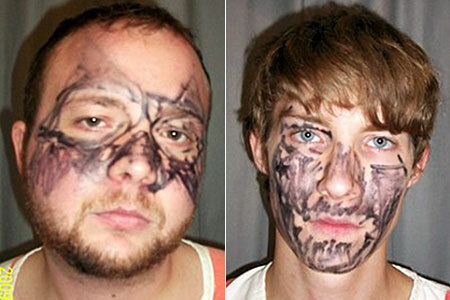 So, obviously, you take a magic marker and smear it all over your face. That would definitely work. Or it’ll be a total disaster. As it turns out, making out with a Sharpie doesn’t quite disguise your face. Plus, odds are it’s a permanent marker, and the only way to get it off your face when you’re done with your robbing is to scrub the top layer of skin off. Then all the cops would have to look for are the two pink-faced, bloody guys with no eyebrows. Yet another weird incident in Iowa. This is more than just a coincidence. There must be something in the water out there that makes people do crazy things like get dogs drunk and beat up zombies.